Saturday Excursions The leader was Park Ranger Samantha. Morning tea was followed by a change over to bus transport with Rob Brouwers (Park Ranger). driving us through areas showing even less understorey, and parts where a fuel reduction burn had been undertaken two autumns ago. The Yellow Gums were particularly affected. Driving further into the Ranges there again was more evidence of human interference. Trees had become too crowded with competition between them resulting in poorer specimens having thinner, taller trunks and smaller canopies. But even so, these canopies being closer together still adversely affected the ground and shrub environment below. In an effort to find the best way to return the forest to its normal state, ecological thinning trials were being undertaken. Here, and in several other areas, a 120 ha lot was divided into equal 30 ha plots. One plot was kept as a control and in the remaining three plots the trees were thinned out in different ways e.g. varying the number of trees left or the clearing done around them. The aim is to do a scientific trial with annual monitoringh of leaf litter, shrub layer, birds, inverterates etc over a 20-30 year period so that the trees are given the chance to reach maturity. Hopefully, developing larger individual canopies and more hollows which could support species now low in numbers. Our thanks to Sam and Rob for making these trips possible. We traveled south into the Paddy Ranges State Park along Paddy Ranges Track to an area known to the locals as The Gorge – a narrow valley formed by rocky ridges on each side of the track. Most of the Golden Wattle, which grew after the 1985 fire, has died off. 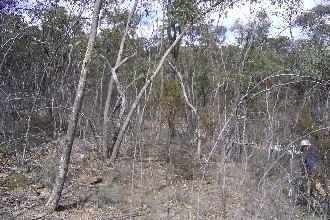 Silky Hakea, Daphne Heath, Cranberry Heath, and Variable Sword-sedge, were identified growing on the dry ridge. Grey thrush, Olive-backed Oriole, Crested Bellbird and Red Wattle-bird were heard. Around a nearby dam 30-40 Yellow-tufted Honeyeaters were seen drinking and bathing. 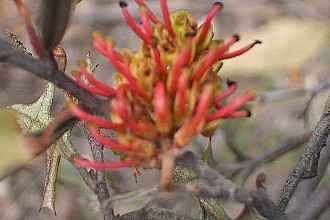 During a cuppa at the picnic area, Goldfields Grevillea was flowering and a sun orchid spike with 6 buds was rowing in a depression near a path were it would has received a little extra water. The final site visited was an area about 80 metres square that had been fenced with netting about 50 years ago. 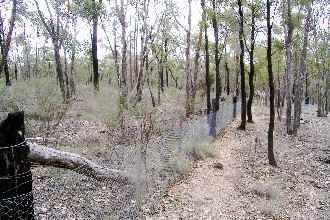 The fence has excluded rabbits and wallabies and allowed a much denser cover of well-grown shrubs and fewer patches of bare ground to be maintained. 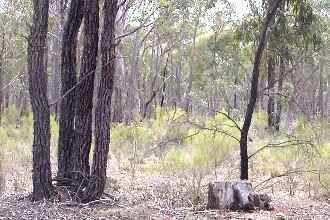 On the way to the fenced plot we walked through an area that contained large Red Ironbark. Many of these had nest boxes which are often house Sugar Gliders. We were also shown a patch of Slender Mint-bush that was just starting to open its pale lilac flowers. The block fenced 50 years ago.